Magical books don’t have to include magic. Just another world to disappear into. Growing up, I was fascinated by school story books. 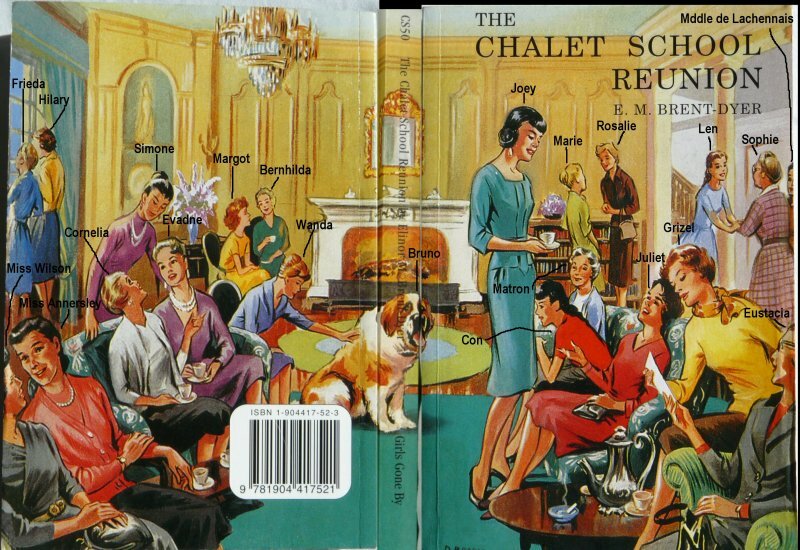 It’s hard to put my finger on why I found them magical, but I think main appeal was that at boarding school you get away from your parents and spend every day and night with your friends. Boarding school creates a world of its own to immerse its inhabitants. My first foray into the genre was good old Enid Blyton. 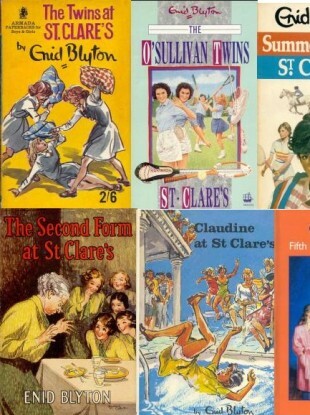 I know many people criticise Enid Blyton for writing poor quality books, but personally she inspired a love of reading in me, which led on to reading many more books. On that basis alone, I think her books are worthwhile. She did for my generation what Harry Potter did for later generations in terms of getting children reading books. Reading her books as an adult, yes they can be formulaic and repetitive, full of slang and stereotypes, and children who have way too much unrealistic freedom–but as a child they were just great adventures. These stories all focus on one or two characters attending the school, and the antics and misdeeds of them and their friends. Often there is some kind of mystery to solve along the lines of ‘who stole my pocket-money’. I was particularly fascinated by midnight feasts–they seemed like the ultimate decadence! The Naughtiest Girl series took things to another level, because the school was run by a parliament of children. They got to judge each other and make up their own punishments, which even today seems radical. This is a series of around 60 books. The main character, Jo Bettany starts off as a young girl of around 12, and by the final book is in her thirties with a family of her own. The Chalet School is set up by Madge Bettany, in the Austrian Tyrol. The series covers from about the late 1920s up to the 1950s, and also deals with the war inbetween. During the war, the school relocates to Wales, and then later, a move is made back to the Continent, but Switzerland this time. The earlier books are the most enjoyable and well written, as towards the end of this prolific series, events become repetitive at times, often focusing around a particular problem new girl who has arrived. Many of the books in this series are out of print these days. I am lucky enough to own the entire series, having inherited it from my Grandma-in-law a couple of years ago. I may do future reviews on individual books at a later date. Different versions exist of some of the books as later editions were often slightly abridged from the original. As a teenager, I discovered the Billy Bunter books. Billy Bunter stories were originally in The Magnet, a boys magazine produced from around 1900-1940. Later, the creator of Billy Bunter, Frank Richards, turned these into children’s novels. These books are set in the fictional boy’s boarding school of Greyfriars. Billy Bunter and his schoolmates are in the form called the Remove (mid teens). They never age or go up a form throughout the series, despite many feature length tales and various school holiday adventures. Billy Bunter books are considerably dated these days, although later editions remove some of the dated language and concepts, and change money into modern coinage. Billy himself is a fairly objectionably character, who spends his time purloining his fellow students grub and borrowing money off them without ever intending to pay it back. However, there is an undefinable good spirit to the stories which generally end in helping Billy out of his troubles and making the bad boys see the error of their ways. Many of the books are available to read online for free, as are original facsimiles of The Magnet. Having written more words than I intended, I will stop there, and will comment on other school stories in a part two at some point! Do let me know what your favourite school stories were as a child, or what school stories you enjoy reading to your own children. Yes, boarding schools seem like a world of their own. I think I was too busy devouring general adventures and horse books, most of them by Finnish authors. Finnish children’s books don’t often feature boarding schools. We barely have any. Ah, but you have Moomintroll 🙂 Another childhood fav. My mom didn’t buy me many series, just random picture books from thrift stores she could afford. I cherished them though. I re-read them so many times I was probably reciting more than reading. I read Harry Potter at the beginning of high school during a rough time in my life. I cherish Harry Potter for being there for me in that time and understanding me. While growing up anything we take in affects us, but I especially believe books are even more affecting.